Seriously Wicked is a YA paranormal fantasy with a few charming twists that make it stand out from the rest. It's the story of Camellia Hendrix, who was stolen from her family by the witch Sarmine Scarabouche when she was a baby, and is now being raised to be a witch herself—something she is adamantly against. She spends a lot of her time sabotaging Sarmine's plans and intentionally not learning how to decipher the code that witches write their spells in. She's a little awkward and doesn't care much for fashion like many YA heroines, but she's also not particularly shy or unsure of herself, which is refreshing, allowing her to much more effectively do what she needs to do to keep the witch's latest plan from working. School is hard but not impossible. There are allies who aren't wonderful and enemies who aren't over-the-top, and despite this being a story about a girl trying not to be a witch, the world in general feels refreshingly real and ordinary. It makes a nice normal backdrop for the stranger events that occur. The book's magic system is interesting: a mix of ordinary ingredients and intent that feels new, and this is where the worldbuilding really shines. There are elemental spirits, pixies, witches in competition with each other, and spells that both feel strange against the normality of the rest of the world and charmingly full of wonder, the way something that is basically Urban Fantasy should but rarely seems to anymore. The culture of the witches is strange and full of truly bizarre punishments for faults—at one point, Cam has her hands turned into cooked noodles, for instance—and it sets up an Us versus Them dynamic that carries most of the book until Cam's view is changed toward the climax. There's a boy, of course. He's in a band, but it's not her sort of music or her sort of boy, and she may not have fallen for him at all if it weren't for an accidental demon possession she needs to help him combat. The whole story with him is sweet and natural, and brings up a grayness in the magic and the world that doesn't seem to exist in a lot of similar YA novels. 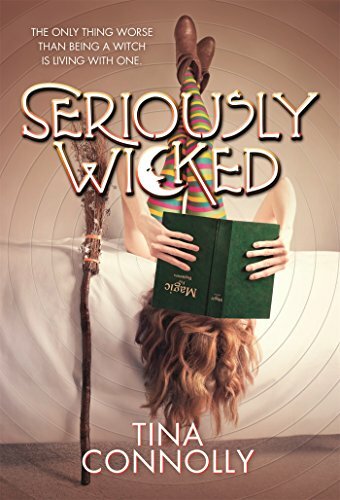 Seriously Wicked is a quirky, strange little book that grows on you quickly and builds to a satisfying and well-handled end, in which Cam takes control of her own life and her history, and does what needs to be done to save everyone—not just one or two people, and definitely not whatever the various selfish and powerful factions have planned. There's enough urgency to keep the story going, but it's a light, sweet sort of read, like a sorbet for the brain in between heavier books. There are points made about personal history and owning yourself, but they're never heavy-handed and come organically from the story itself. It's also a short book. A strong reader should be able to finish it quickly, and while it could definitely have been “thickened up,” it doesn't ever feel like story or character are being compromised by the shortness. Seriously Wicked is very well-crafted, with characters who feel like people and plots that are strange but feel natural to the story and the world presented. This could easily be the start of a series, but it stands on its own just as well. Overall, it is sweet, lighthearted fun with a nice multi-layered world to spend some time in.